The Waved Albatross is also known as Galapagos Albatross. It is the largest of the Galapagos birds with a massive wingspan of 7 – 8 feet and weighing 7 – 11 pounds. They can grow to measure 86 centimetres (34 inches) in length. Waved Albatrosses are distinctive for their yellowish-cream neck and head, which contrasts with their mostly brownish bodies. Even more distinctive is their very long, bright yellow bill, which looks disportionately large in comparison to the relatively small head and long, slender neck. On the ground they walk with a waddle and appear to be very clumsy, but in the air, they are one of the most graceful birds you could ever see. Waved Albatrosses are extremely loyal birds to each other whereby when a male finds a female mating partner, they will stay together and raise their chicks until one of them dies. The primary food sources of the Waved Albatross are fish, squid and crustaceans. But they have also been observed to scavenge for other food sources, including the regurgitated food of other birds. Waved Albatrosses can live until they are 45 years old. The longest living Albatross has been recorded to have lived until 51 years old. The Albatross is probably one of the oldest living birds. Waved Albatrosses are found on only one of the Galapagos Islands – Espanola – where they congregate in two major colonies. Like other birds that primarily glide, the Waved Albatross relies on strong headwinds to be able to take off. The Waved Albatross, like other Albatrosses, spend part of their year at sea. The Waved Albatross, does not travel very far and when it does travel, it is not gone for a very long time. From January through to March, they are found in the Pacific east of the Galapagos, and along the coasts of Ecuador and Northern Peru. Many Waved Albatross often congregate in the Gulf of Guayaquil. They begin to return in mid-late March, the males arriving first. As the Waved Albatross mates for life, the male returns to the previous years breeding territory and waits for his partner. Waved Albatrosses engage in a very lengthy, noisy and complex courtship ritual, just like other Albatrosses. They dance and fence with each other with their beaks, in which the partners bend, face each other, and rapidly slap their beaks back and forth. In another step, each faces the other in an upright posture, sometimes poising with beak wide open. Their beaks are then shut with a loud clap. Sometimes the birds will clatter their beaks rapidly. The dance also involves bowing, and parading around one another with the head swaying side to side in an exaggerated sway, accompanied by a nasal “anh-a-annhh” sound. The dance is longer and more involved when a new pair of Albatrosses meet, or in pairs that have failed to breed in the previous season. When the female lays her egg between mid-April and July, both the parents incubate the egg for about two months. In the early stages of incubation, each parent takes long turns with the egg that can last 3 weeks at a time. As hatching time grows nearer, these turns with the egg are shortened. 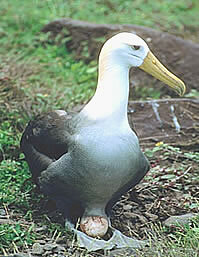 The female Albatross lays her eggs on the ground as opposed to making a nest for them. During the incubation period, the parents frequently roll the egg about, covering distances as much as 40 metres. The reason the Albatrosses do this is uncertain, but this activity seems to contribute to a more successful hatching of the chick. When the eggs have hatched the chick is dark brown, and covered with curly dark brown downy feathers. During the first few weeks after the chick has hatched, one parent guards the chick while the other collects food. As the chicks get a little older, they are left unguarded in nursery groups while both parents spend longer out at sea searching for food. Whatever food is captured it is held in the parents stomach, where it is converted to an oily liquid. 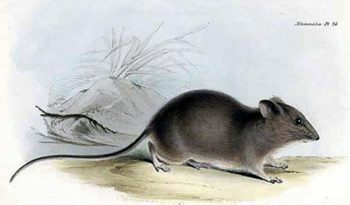 The parent can hold this liquid in its stomach without digesting it for a considerable amount of time, making its hunting expeditions more efficient as it does not have to return frequently. When the parents return to the colony, they find their chicks and then pump the liquid into the chicks stomach. As much as 2 kilograms of liquid can be forced into the chick stomach at one feeding time. This volume makes the chick swell and look like an over-inflated brown bag. It can barely move until the oil is digested. This keeps them full and fed while the parents return to sea for lengths of time to search for more food. When the chick have fledged, they leave their nurseries and fly with their parents to the West Pacific. The parents do return each year to Espanola to mate, but the fledglings stay away for five to six years until they are ready to begin breeding for the first time. The population of Waved Albatrosses on the Galápagos is protected by national park personnel. But limited range, bycatch by long-line fishing, disturbance via tourism, disease and the effects of illegal fishing in the nearby waters place them in considerable jeopardy. Particularly long-line fishing sems to be making a severe impact in the species, which was uplisted to Vulnerable from Near Threateened by the IUCN in 2000. Despite some 34,700 adult birds still occurring in 2001, their numbers have apparently started to decrease at an unknown rate more recently, probably due to longline fishing which also upsets the gender ratio (males being killed more frequently). 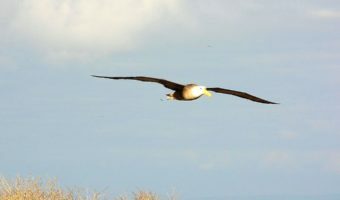 As the current situation makes the population highly vulnerable to a catastrophic collapse to extinction, the Waved Albatross is uplisted to Critically Endangered status in the 2007 IUCN Red List.